Let us return to Elly's tale of entrepreneurship. Elly knows she wants to crowdfund her widget, the question now is how? After numerous hours of researching online, comparing crowdfunding websites, and creating content for her campaign, Elly has everything prepared. On the front page of her campaign there is a compelling video describing what the widget is, how a person will benefit from funding the project, and how Elly is going to use the $10,000 (to finish designing the widget, build it, and ship it). Underneath that is a short paragraph again describing what the widget is, as well as other details of the project. To the right of this there are a few numbers shown: the total amount raised, the total amount needed, and the number of backers. By looking at this panel, it may seem that Elly is going to get $10,000 towards the widget project, but this is not the case. Crowdfunding websites take a percentage of the money raised from each campaign, usually around 4 or 5 percent of the total funds raised (they have to survive too). That means if Elly raises $10,000, she will only truly receive about $9,500 (the other $500 will go to the crowdfunding website). While she won't receive the complete $10,000, it is important that she raise at least this amount, otherwise she may run into some negative consequences. For example, if the campaign raises less than $10,000 on Kickstarter (for example $9,000), then all of the money is returned, and Elly doesn't get a dime. Other websites like Indiegogo increase the percentage they take from the campaign; instead of 4%, Indiegogo would take 9% of the total amount raised if it was under the goal. Elly needs to pay attention to these number for budgeting reasons. With the money she raises, she needs to be able to produce, and ship whatever incentives she offers, like the ones below. 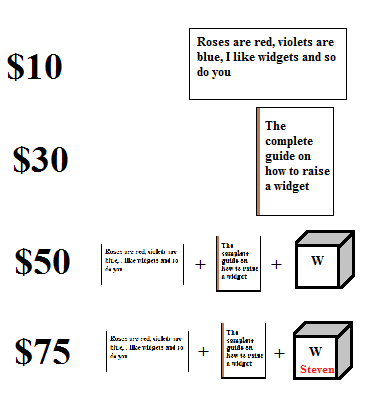 At $10 Elly will mail you a letter with a widget themed poem on it. For $30 Elly will send you the "How to raise your widget manual". For $50 Elly will send you your very own widget, the manual, and the letter. For $75 Elly will send you all of the previous items, and inscribe your name on the widget. As one can see, these don't have to be extremely serious incentives. If you brought up the offer of a poem to a venture capitalist you would probably be laughed at. Instead the offerings need to be clever, engaging, and offer some incentive that the funders would value and can afford. Perhaps Fred has some extra money and wants to fund at the $75 level so he can show off his engraved widget to his friends. At the same time Ted is a little low on money and just wants to support Elly. He would feel much more comfortable sponsoring at the $10 level and receiving a widget poem. Crowdfunding Part 1: What is it?